Weighty Matters: Frankenfood - Deep Fried Butter! Sorry, that was the sound of my breakfast being retched up. 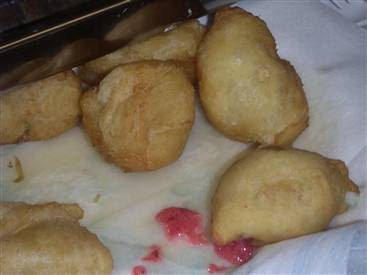 Yup, someone has invented deep-fried butter. My favourite part of the video below? I think it's when the inventor explains it's not as if he's just taking big slabs of butter and then deep frying them and then he just takes big slabs of butter and deep fries them.